The Red Poll cattle were developed as a dual purpose breed in their native counties in England. Breeders sought a type that would fatten readily rather than be of extreme size. A good milk flow was also considered important in selecting breeding stock in the development of the breed in its native land. The counties of Suffolk and Norfolk in England are the original homes of the Red Poll. The blood red, hardy, early maturing Norfolk beef cattle and the Suffolk Poll, which were light red and known for their milk and butterfat production are the ancestors of our Red Poll cattle today. It is not definitely known when the two breeds were first crossed, or what infusions of blood may have been from other breeds. Galloway cattle and Devons were brought into the area, and, no doubt, some of this breeding found its way into what later was called the Red Poll breed. Red Poll cattle were first introduced into the USA in 1873. The breed was established in the United States on only about 300 head that were brought in from Britain. The breed spread from the United States into Canada. The first Red Poll cattle arrived in Australia in about 1850. 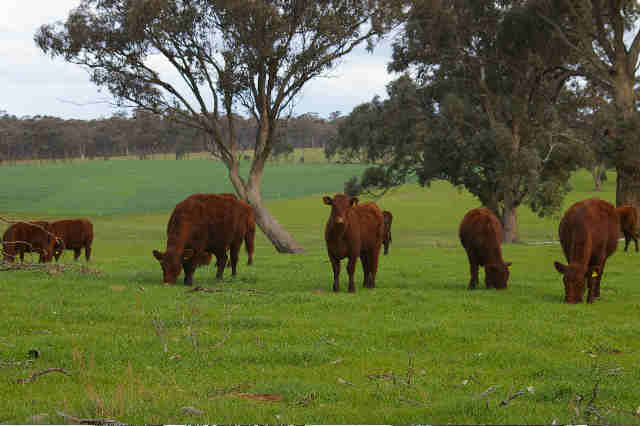 Two Victorian grazing families had Red Poll cattle in their herds many years before the 1890’s when the breed started to become more widely recognised and used in Australia. Mr Andrew Chirnside, of Werribee Park, imported four Red Poll bulls from England in 1891. The modern Red Poll cattle breed is very underrated. The popularity of the breed is steadily growing within Australia. Although there were both beef and dairy herds formerly established in Australia, the major herds are now used for beef production.